Pack size: 2 x 300ml bottles & 2 contact lens cases. Review Opti-Free Puremoist (formerly Evermoist) Duo Pack Keeps my eyes moist all day long and I would wear my contacts from 6am till 12am!! Review Opti-Free Puremoist (formerly Evermoist) Duo Pack I like this product. No issues with it. A multi-purpose cleaning solution, Opti-Free Puremoist Duo Pack will allow you to discover the sheer freedom and joy of wearing contact lenses all day long. Made using a patented HydraGlyde Moisture Matrix formula, this mild yet effective solution will keep your eyes fresh and comfortable as it retains moisture for almost up to 16 hours. In addition, the trademark TearGlyde reconditioning system creates a layer of moisture by working in harmony with your tears. This gentle layer also prevents unwanted formations such as protein or lipid deposits. So that right from the second you insert the contact lenses on your eyes in the morning until late at night, you will never feel the slightest discomfort of wearing contact lenses. Hence, Opti-Free Puremoist is perfectly suitable for people with dry and sensitive eyes. The proven dual disinfectant system in the solution protects your eyes from harmful bacteria that could cause eye infections. It also prevents red eyes and reduces oily build ups for clear vision. 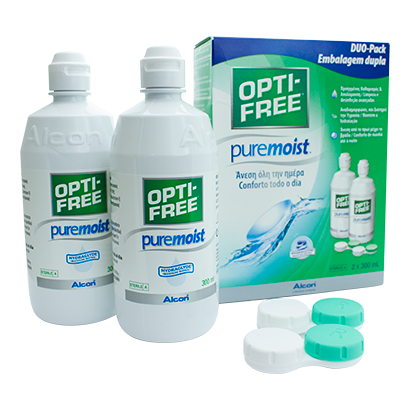 Recommended for disinfecting, rinsing and cleaning of all kinds of soft contact lenses, including silicone hydrogel lenses, Opti-Free Puremoist is a safe and healthy formula for a truly comfortable lens wearing experience. It is so easy to use that you can simply soak your lenses in this gentle solution and make them fit for your next day wear. Ideal for travellers, each pack contains two handy 300ml bottles.